The visionary whose designs have been realized in La Sagrada Familia was already well known in Barcelona when he took on responsibility for the basilica in 1883. He continued the work until his death in 1926. As he was walking to church for his daily prayers he was hit by a tram. He died three days later, on June 10, 1926. Gaudi did not put most of his ideas for La Sagrada Familia on paper. Instead, he created three-dimensional models, some of which can be seen in the museum of the basilica. It is largely from these models that construction has proceeded. The church we see today takes its form from Gaudi’s original plans. 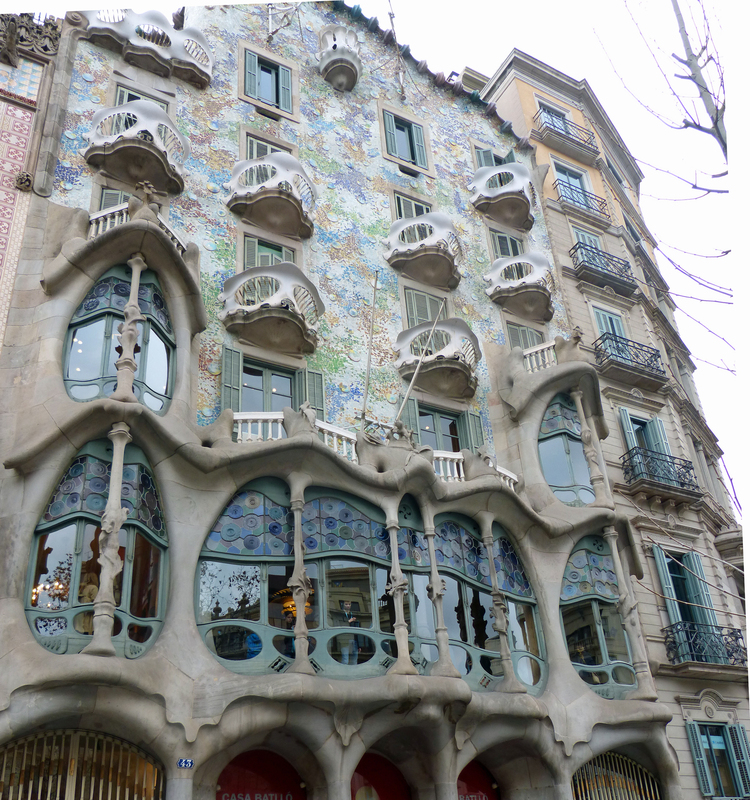 Many of Antoni Gaudi’s designs are “playful” and take their form from nature. 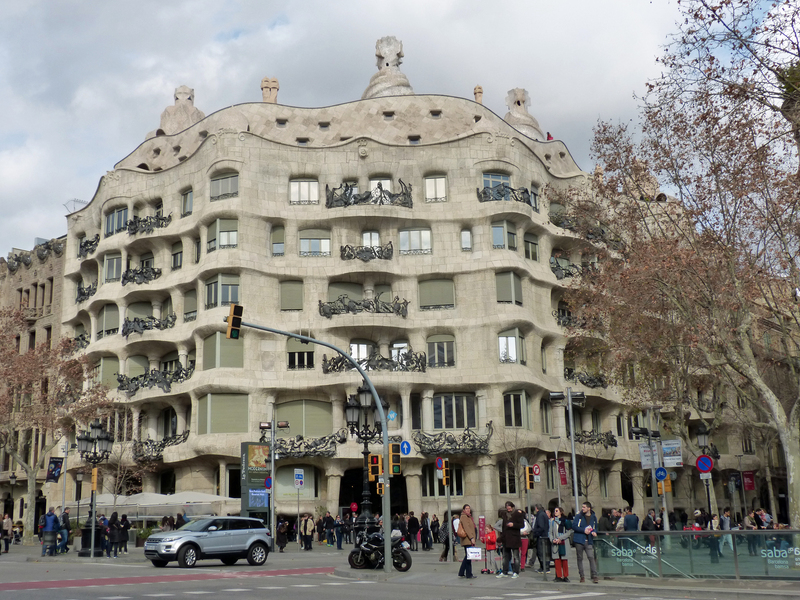 One of his most famous structures is Casa Mila. People were lined up to buy expensive tickets to enter when I walked past that on a Saturday afternoon. 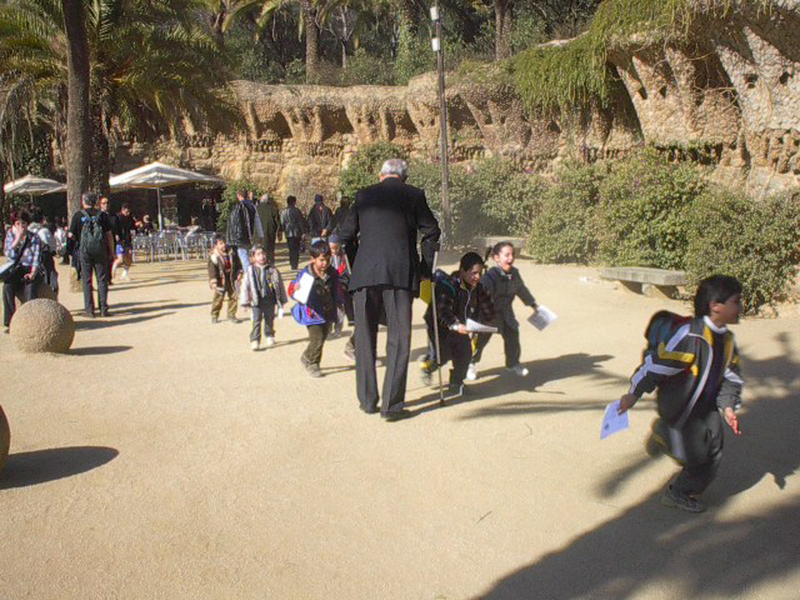 Another is Park Guell, a unique and delightful place in Barcelona, enjoyed by children and adults. Elinor Moore wrote to me about a book on Gaudi that she enjoyed. It is Gaudi: A Biography by Gijs van Hensbergen. Thanks, Elinor! 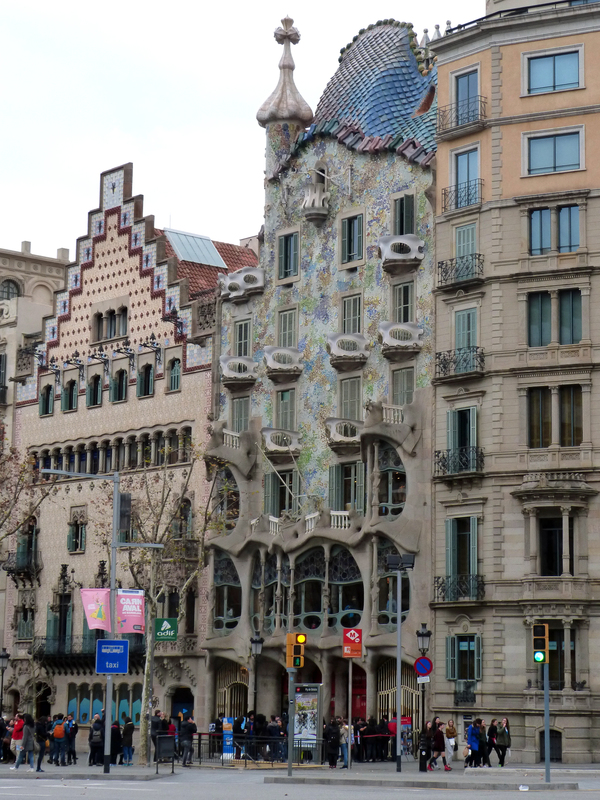 Wikipedia has a lengthy article about Mr. Gaudi here. A list with photos of all his buildings can be found here. La Sagrada Familia has been under construction since 1886. It is today’s living example of how gothic cathedrals were built – slowly, often over hundreds of years, evolving with the styles and the decisions made by each architect/builders in turn. 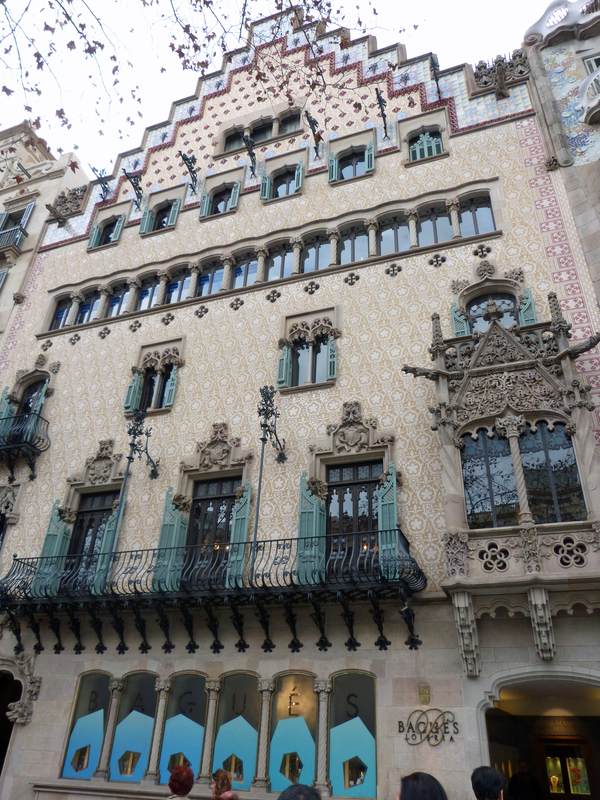 The project was designed and initiated by architect Antoni Gaudi. (Read about him here.) After Mr. Gaudi’s untimely death in 1926 building of the cathedral continued under the direction of his chief assistant. It has actually never stopped although it was vandalized during the Spanish Civil War of the 1930s. It’s expected that construction will be complete in about ten years. 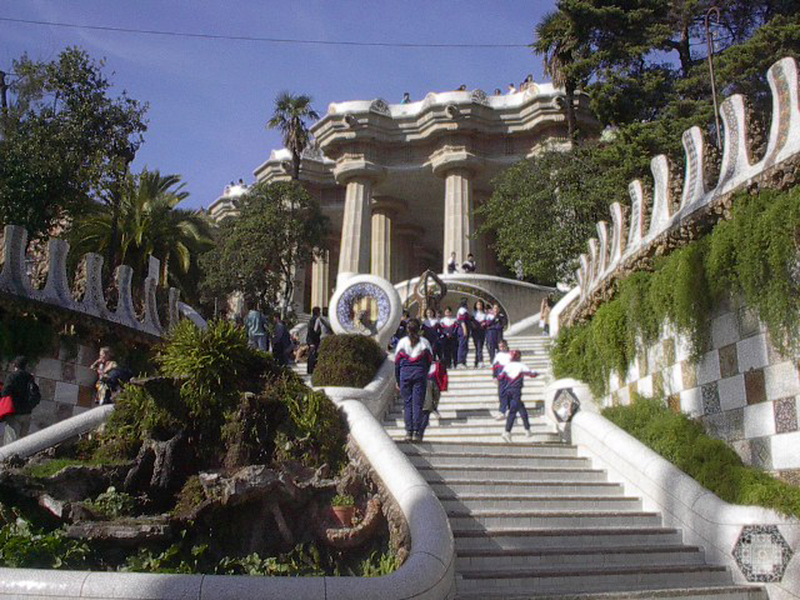 I first saw this magnificent place in 2002 when my husband, George, and I visited Barcelona. I was happy to return a few days ago to see the great progress that has been made since. My pictures aren’t the best. If this subject interests you, go to images.google.com and spend some time considering the many images you will find there. I can’t begin to tell you all I’d like to about the history and construction of this remarkable church. Instead, below are a few links. Begin with the official site of La Sagrada Familia. I leave you with this image of the new doors to the Glory façade. 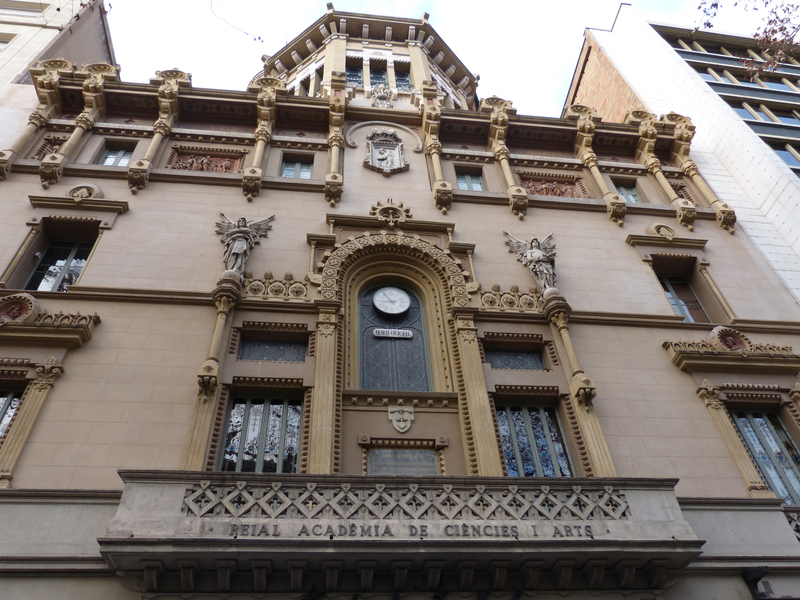 The doors are approximately 50’ x 50’ and have been scultped by Josep M. Subirachs and Bruno Gallart. 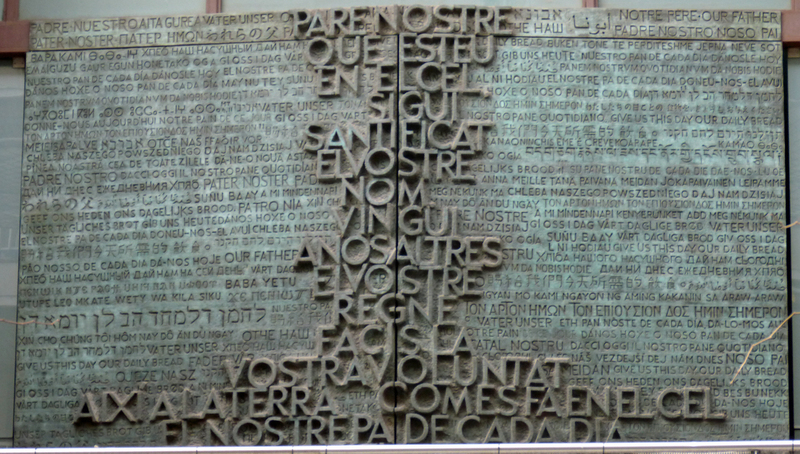 The image on these doors is the Lord’s Prayer in the Catalan language with a background of the words in many other languages. 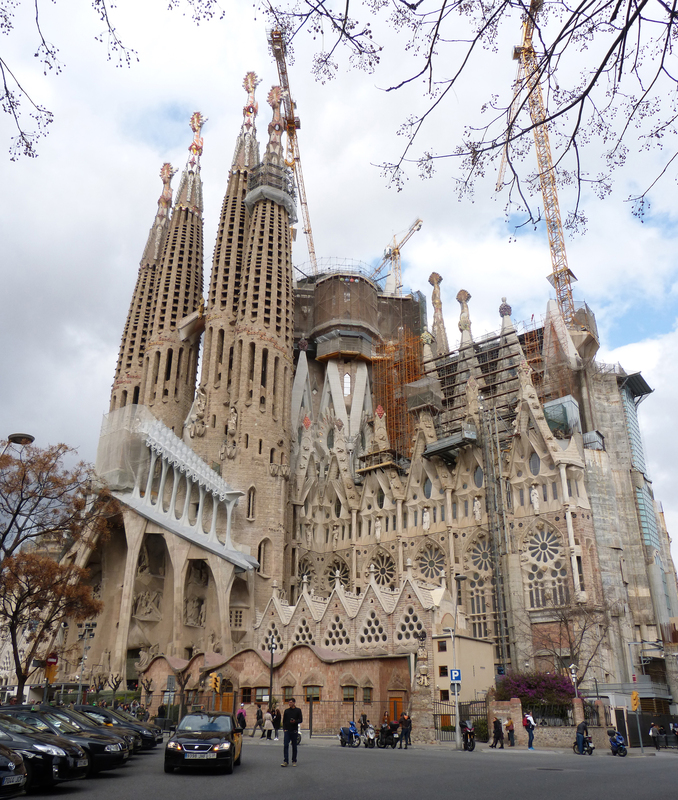 https://www.bluffton.edu/~sullivanm/spain/barcelona/sagrada/sagrada.html Mary Ann Sullivan at Bluffton University has posted a site about Sagrada Familia with more than 90 photos. Click on pictures that interest you to make them much larger. 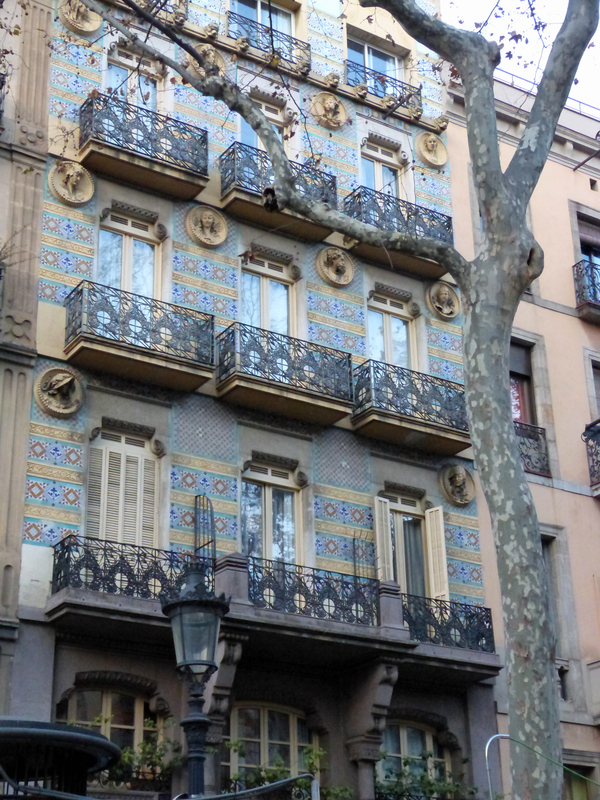 I don’t think there can be a city with more beautiful buildings than Barcelona. By that I’m referring both to the designs used in the creation of buildings and the number of extraordinary buildings in this city. Although there are many striking late 20th century buildings to be seen, it’s those designed and built in the late 1800s and early 1900s that I find to be beautiful. My hotel is on a street called “Las Ramblas.” Today this is the tourist center of Barcelona, filled with all the fast-food places and retail stores the “global economy” can produce. Normally I’d avoid a street like this when looking for a hotel but having been here once before I knew that this street would be interesting and fun. It is! It was a major business street of the late 19th century and it’s lined with distinctive buildings including three large theatres (still operating, one as the opera house), a number of hotels, and the large market hall. I can’t show you all that I’ve seen so I thought I’d share with you some of the buildings that caught my eye. 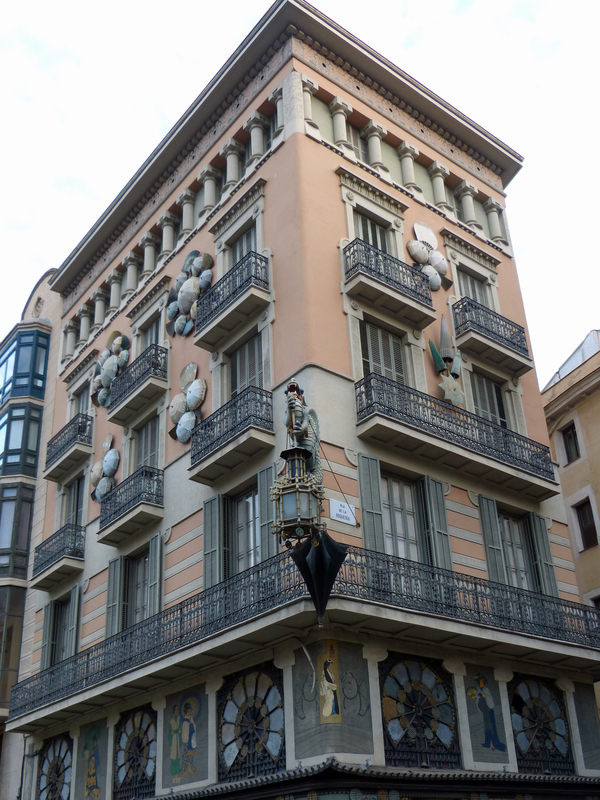 This pair of buildings is typical of the 100 year old hotels and apartment buildings that line the street called Las Ramblas. Here’s another I thought was lovely — I like the pink! 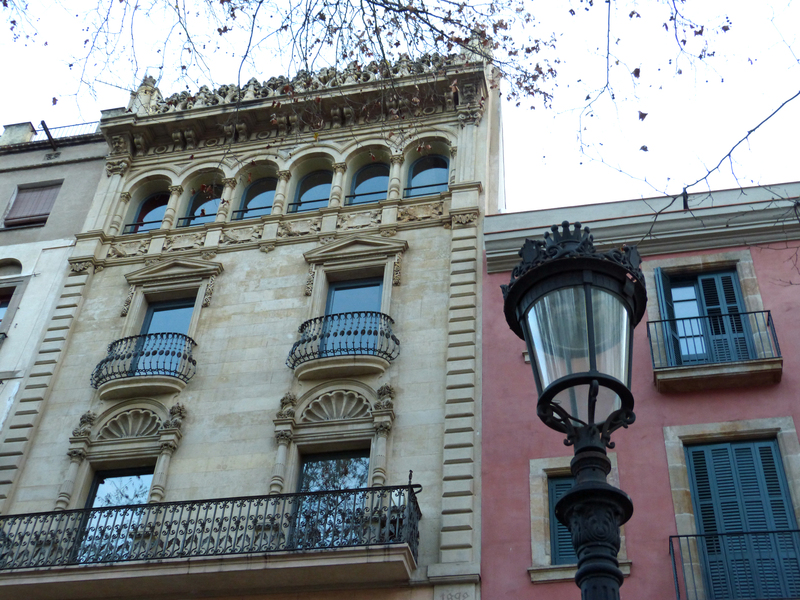 I could do an entire post on the charming street lamp styles I’ve seen in Barcelona. Here’s the building that’s perhaps most famous: the Chinese Umbrella building. Read its history here. 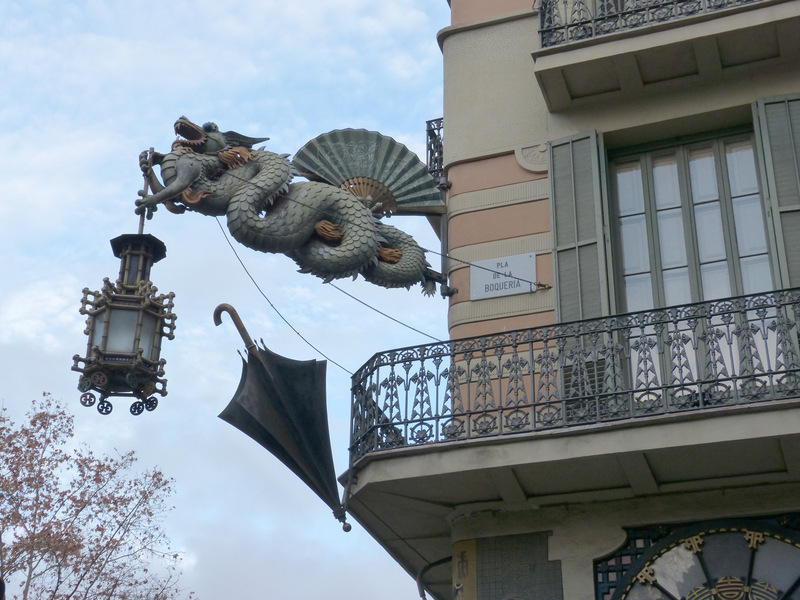 A close-up of the dragon on the corner. 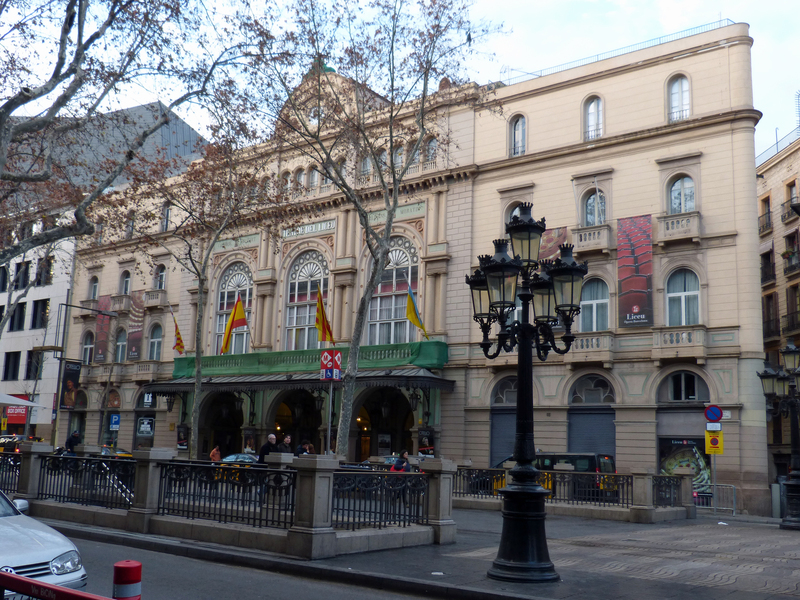 One of the theatres along Las Ramblas. Barcelona’s most famous citizen is Antoni Gaudi, an architect who left this city with a number of extraordinary buildings as well as one of the greatest churches in the world, the Sagrada Familia. I’ll tell you about that tomorrow, but here are shapshots of two of his apartment buildings I passed by yesterday. There’s a different sort of street parallel to Las Ramblas just one block east. It’s called Passeig de Gràcia. Here are the famous European, hyper-expensive shops such as Channel and Louis Vuitton. But along this street as well are many beautiful buildings and as well as a block noted for the extravagant architecture of three famous buildings in that block. Next door is this building of extravagant design (read about it here). And at the end of the block, this one. Today I return to France. I’ll be in the small coastal town called Collioure for a few days. 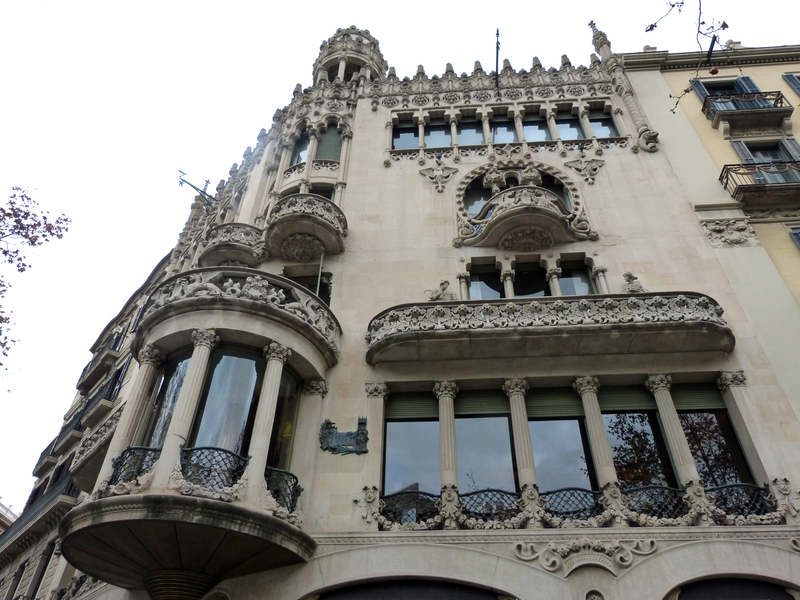 My hotel on Las Ramblas in Barcelona is Hotel Lloret. I found it on Booking.com and have enjoyed a very comfortable, well-located hotel at a very good rate. If you’re coming this way I recommend it. A note added in August 2017, after the horrible terrorist attack on Las Ramblas: First, to the people of Spain, my condolences and support. To travelers thinking of going to Barcelona or to Spain or anywhere else: don’t let the terrorists keep you away. That’s what they want, that’s how they win. Your chances of being hurt by terrorism as minniscule. Fourteen years ago my husband George and I were here. For those who haven’t heard this, I’ll quickly tell you that we spent more than eleven months traveling around Europe in 2001-02. We spent most of January in Spain. We were the original low-budget travelers and we learned that it was much less expensive to stay on the outskirts of major cities and to travel into the city by public transit. We did that for four days in Madrid. My memories of that city begin at the royal palace and extend into the lush garden that lies between the palace and the center city. I will always remember the many beautiful buildings that stretch along the main avenue – most built, I think, in the early part of the 20th century. 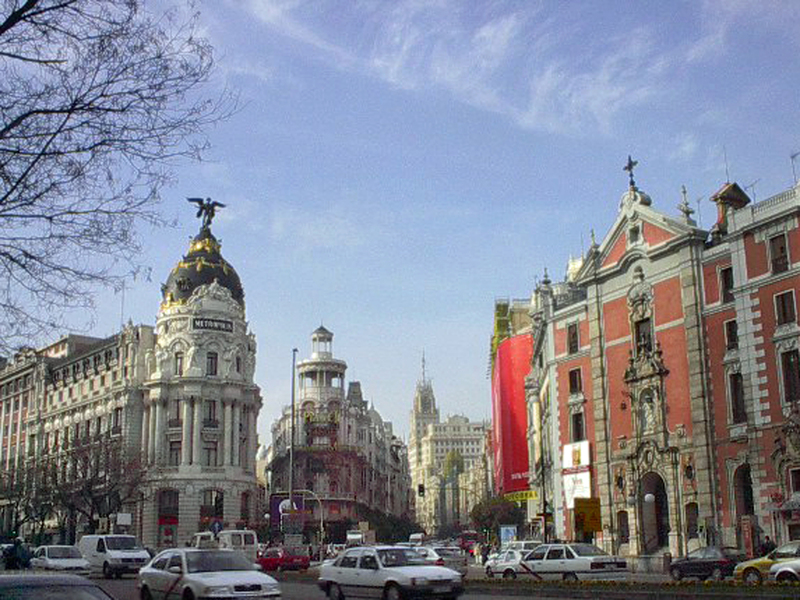 Here and at the top of this post are a few pictures of the principal avenue through the Madrid business district that I took in 2002, with apologies for the quality of the images – my camera wasn’t very good. 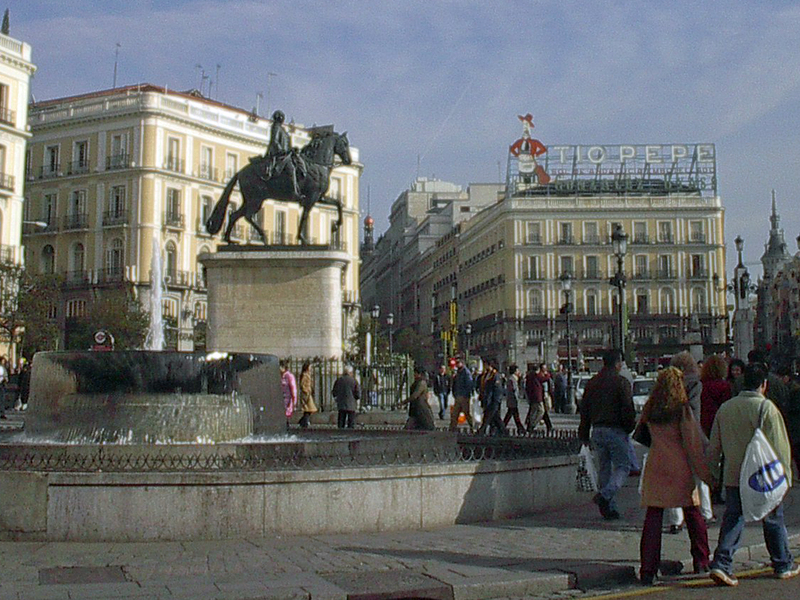 The “Tio Pepe” sign on the building on the right is a famous landmark in Madrid. Another of the beautiful buildings that line this street. The Prado was begun by a Spanish queen in the 1820s to exhibit the fabulous collection of art belonging to the Spanish royal family. The lady was smart! Not only has this collection remained intact, but it has become one of the greatest art museums in the world. As I may have told you when I was in Antwerp Belgium, Spain controlled the Netherlands and Belgium for many years from the mid-17th century. As a result the king of Spain became the owner of many of the greatest artworks from that region dating from ca. 1400 forward for about 300+ years. For reasons I don’t know, the Prado also has a very large collection of works by some of the greatest Italian painters including Rafael, Titian (Tiziano), and many others. Caravaggio’s excellent painting of David with the head of Goliath is here. In addition there is a superb collection of the works of Spanish artists – not only Goya and Velazquez but many little-known masters. I really enjoyed viewing those. The museum didn’t allow photos to be taken in the Prado so I’m going give you a list with links to show you just a very few of the great artworks I saw yesterday. And here’s a question for those readers who enjoy great art and who have visited art museums that contain them. When I left the Prado yesterday I thought this: If someone who was unfamiliar with classical art asked me to name the only museum she or he would see in a lifetime, I would recommend the Prado. So my question is: Which one would you suggest? Which is your favorite museum of art? Please answer in the “Comment” section. Thanks! 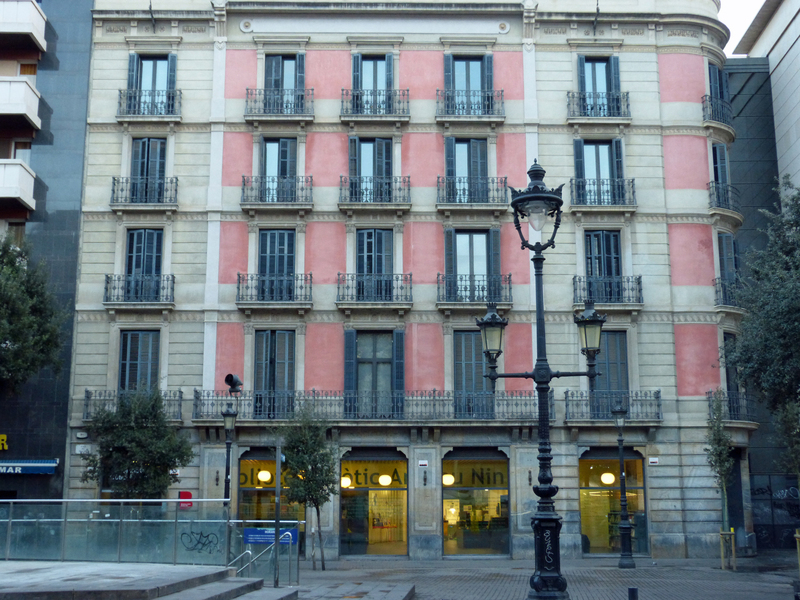 *My hotel was Ibis Styles Prado on Calle de Prado. 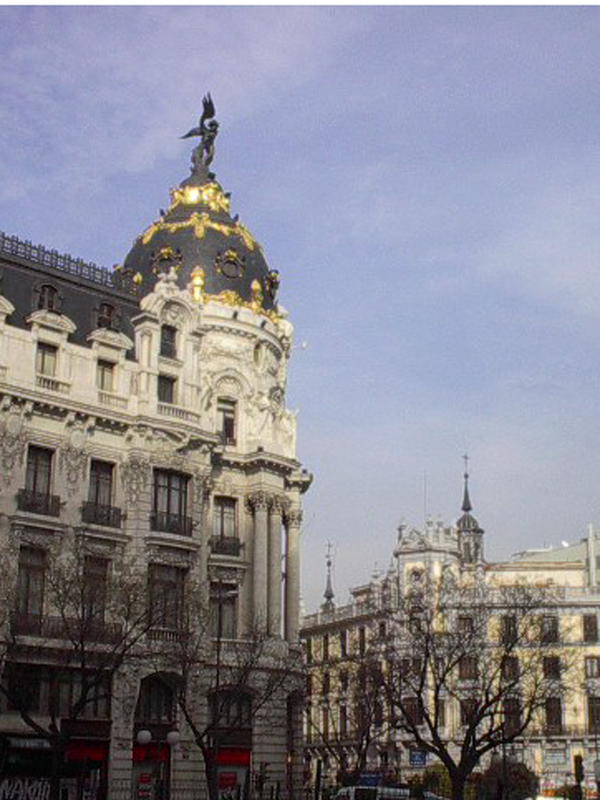 I found it to be very good, with terrific service from the front desk staff and the rate was low for central Madrid.